"Christian Isobel Johnstone, called "the bravehearted lady" by Thomas Carlyle, was editor for more than a decade of Tait's Edinburgh Magazine, a journal famous for its vigorous liberal viewpoints and incisive literary reviews. 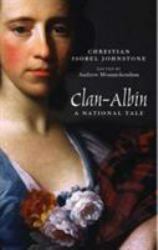 In 1815 Johnstone also became the author of one of the most extraordinary novels of the Romantic era, Clan-Albin. The story is centered around the childhood and adolescence of its orphan hero, Norman Macalbin, who leaves the poverty of the Highlands to volunteer for the army and journey in Ireland and Spain: but throughout the novel it is the voices of the strong female characters - Lady Augusta, Monimia, Flora and others - that we hear most clearly. These bring to us Johnstone's lament for the loss of Highland culture and scorn for the emergent southern mercantile classes, and portray war as a terrible tragedy whose glorification is unforgivable. Written in the year of Waterloo, Clan-Albin is a unique Scottish novel by an outstanding and neglected female voice." --BOOK JACKET.